They started to train together and Tai swore not to ditch them ever again. Tai lead her friends to the abandoned battlefield. Nya and Sylva gasped. Tai had gained a lot of skill with Sir Robin and defeated Nya, but it came with a cost. She tricked Nya into believing that she had lost and then stuck Nya in the head from behind. Sylva was different though. Sylva had furnished her dagger more and it blinded Tai before striking. When Tai threw her powder, the intense heat from the amplified light rays from her blade destroyed it. Tai had to move on to rose vs dagger. Tai charged at Sylva, both engrossed in a tough duel. Sword fighting was her weakness, she never dared to use it on Sir Robin. After ten minutes of fierce battle, Sylva got the better of Tai, slamming the rose out of her hands with the flat side of the blade. Tai wasn’t finished yet, she threw black powder in Sylva’s face, but she learned some tolerance skills and shook it off. That was hard to do though. Tai tried to use her lunar spell, but Sylva finished her off with a blow from her hammer. Within the central hall of the abandoned building, Sarazov and the four newly converted cultists were beginning their ritual for Tourach. Only the full moon's light illuminated the hall from the holes of the roof and from the broken windows. A cold wind howled through the corridors, where broken furnitures rotted. Before Tourach's servants could begin their chant, the large front doors of the building were pushed open. Sarazov turned his head and looked at the interfering person, who stepped in. The person looked human but he had a foreign robe and strange fins around his body. He calmly looked at the five humans in dark clothes. "If you wish to perform rituals in secret, you shouldn't chant about it loudly within the forest." As the converted guardsman flicked his fingers at the talking merfolk, nothing happened. Then he saw how the fish man's slender fingers kept pointing at him. The merfolk had no weapons, yet he could stop him from casting any spells. "Typical humans. Such lust for power and worship. But the currents of Eternstor and this tournament can't be stopped even with the foulest of magic. As soon as the contender named as... hold on..."
The merfolk wizard took a list from his belt and quickly glanced at it. "...Tourach. You're devoted for her, aren't you? When she arrived, people began to disappear and dark powers were on the move. Homeless humans have been found dead in dark robes which resembled the cloaks you're wearing right now. A slimy big fish that likes to eat smaller defenseless ones, don't you think?" "Silence in the name of the Dark One," Sarazov shouted, unsheathed his shortsword, and pointed it at the irritating wizard. After a moment, eight soldiers rushed into the hall from the great entrance of the abandoned building. They all had light metal armors with a crest which has been seen on the guards of the tournament. They unsheathed their longswords and took a stance while iron manacles rattled in their belts. The soldiers slowly approached the nervous cultists in a line. The merfolk pointed at Sarazov with his right hand's finger. "You dare threaten Eetu, Shield of Currents? Then the currents shall take you." 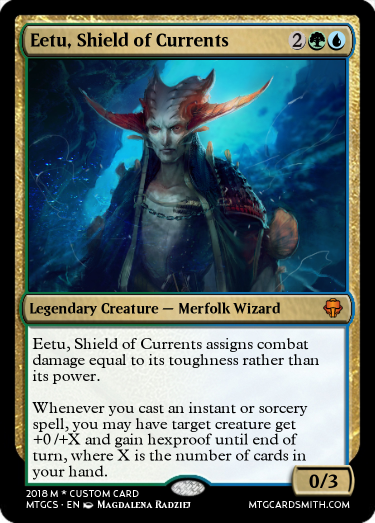 The cultists tried to break the will of soldiers with the bestowed powers of the Dark One, but Eetu's defensive magic shielded the soldiers from them. Sarazov charged at the problematic merfolk only to have his hands cut by three nearest soldiers. He dropped his sword on that moment and fell onto his knees a second later as one of the soldiers punched him to the stomach. Purple glow started to fade from the four newer cultists as they were lying on the dirty floor and being put into the manacles. When the converted guard was chained as well, Eetu walked to him and ripped off his mask. "And you will go where the currents drag you." So your powder is weak to heat? Standing up after what had seemed like years, Caphria headed over to a group of guards and tavern regulars, her wings compressing into her back. She measured 11 inches (28 cm) shorter than the tallest of the group, but nevertheless they hesitated when she approached, looking skeptic. "Mind if I join you, comrades?" "Why would you want to join us, angel? You are a being of the heavens, and we are but lowly humanoids. For what reason would you care to stand on the same level as us?" "Perhaps you did not hear my proclamation when I entered; I may have once been created to serve above your causes, but that is no longer true. I wish to connect with everyone, no matter their level, and I am here now to make this occur." "You say you once served a higher cause? What changed?" "A long story, but to put it simply, I made a grave miscalculation in my duty, and was shot down for it. I no longer am nothing but a 'fallen angel' except in my appearance, and have since sought to change that title by redeeming myself in the eyes of mortals." The word mortals had a strange tone to it, as if the angel had nothing but faith in the guards and others in the tavern. "Very well then, Caphria, was it? My name is Garen Krister. I cannot speak for my friends, but I welcome you into our gathering. I would offer you a drink, but I do believe that your kind neither requires nor wants for any type of sustenance." And with a smile, the seraph joined the group, talking some and listening to every piece of information that they were willing to provide. Nya stood up and watched the 2 of them battle. It was fast and ferocious, but sylva won. After their battle Nya walked over to sylva. "Let's you and I have a battle." Said Nya pointing her stick at sylva. Sylva readied her hammer and dagger. Sylva was fast but that didn't matter. Nya stood her ground and seemed to take the full force of the hit. Once sylva moved away she saw, vines had shot out of the ground and stopped the attack. She then sent beams of golden light directly at sylvas face, she dodged and struck Nya, this time actually hitting her. Sylva landed back on the ground and prepared to strike Nya again but tripped. Her foot was caught in vines. They then shot up her body and completely encased her. Nya had won. She sat down and healed her wounds with what little healing magic she had. She looked up and realised that sylva was still encased, she then promptly freed her. "That was some trick." Said sylva still struggling to breathe. @pjbear2005 In very intense heat. With the light reflecting off the glass and that coming from the sun, it kind of burns it away with the heat of the light. So kind of. Tai’s healing powder is NOT though. When Tai got back to her room, she immediately pictured the situation of her facing Sylva and her powder being countered like that. She needed to find the Pyromancer. Who was it again, Pili? Peel? Pele? It was Pele, Tai thought. Tai searched the city and hotel for Pele and found her throwing flames at the water. Why At the water? Surprisingly, the water caught fire! It want out quickly. Tai raced over to Pele. “Who are you?” Pele asked. “Why do you seek me?” Pele pressed. “My powder. I need you to help me strengthen my powder. Can you? Please help me!” Tai begged. Pele nodded gravely and stared at her. Her eyes were deep brown and intense. She tested it and it just burned away. The two worked together to build a more resistant powder, but still not completely resistant. “Thanks,” Tai said as she hurried back to her friends. “Why do you need?” Pele asked. Pele nodded and stared at her. Her eyes were deep brown and intense. She tested it and it just burned away. The two worked together to build a more resistant powder, but still not completely resistant. A fiery claw snatched her from the air and returned her to the ground. Pele said, “There is a price though." Tai hesitated. Her dust? Suddenly a light flashed in her head! @pjbear2005 you have three throws of red dust. I present: ding mettir of the broken coast! By the way he has limited telepathy but no other special powers. Mettir grabs a toothpick off the table and fiddles with it, muttering under his breath. @kandra127 Is that the one you used in the first one? Pele walks into the tavern seeing a new face. It looked like some type of merfolk but taller than other ones. Koorir throws his hatchet in the air and kicks it into the wall, then he retrieves it. Explanation enough human? Not waiting for a response he grunts and walks off. @shadow123 @Bobman111 Thanks for writing bits of story for Sylva. I'm not that good at writing without a lot of preparation. I like how Tai, Sylva, and Nya all are growing to be friends with each other. I couldn't hope to have written all the character development you guys have. Thank you so much! Tourach was standing in a clearing in a particular forest, illuminated by a particularly bright evening sun. The former High Priest of the Ebon Hand was pondering over the situation she currently stuck in. Last night, another ritual was interrupted again. Yet, she had to hold her vendetta towards the perpetrators that interrupted the rituals due to some particular gods that could possibly observe the situations she stuck in. And her suspicion was the god she encountered in the first place. 'He must have been already observing my actions since my first arrival in the tavern's hall.' The lich frowned. Although the plane just apparently a plain, normal world, but after the act of gleaning some informations around, and by gleaning it meant that extracting some particular memories from some random unimportant civilians from the tavern because another act of killing would raise too much suspicions, she knew that at least there was one of those 'Ethereal' gods who was currently attending the tournament. "What should we do now, my Lord?" A cloaked ghostly apparition that was kneeling in front of her spoke with a ghastly voice, a wraith. The wraith that was once Sarazov, her first personally converted person that died in the hand of a merfolk after the attempt of second ritual could even finished. But of course she had already foresaw that situation. "From now on, venture towards the north and search for a small settlement that can be converted if possible. Return immediately after you find one." "It shall be done, my Lord." The ghost just turned into an almost transparent cloud of dark mist and it quickly floated away through the dark of the forest, then it went out from her sight. 'Complications are always to be expected.' Pondered the female lich darkly while was walking back to the small city that was currently brimming with more people than usual due to the tournament. She could just transform herself into her dark and misty form for a faster method of travel, and to make herself impossible to be harmed by physical damage, but only when the opportunity presented itself due to the possible suspicious eyes of people that could judge the usage of her dark magic that were also lurking around in the city. In the end, the former High Priest of the Ebon Hand just decided to stay low and act like a normal practitioner of magic with a slight genetic deformity who wanted to attend the tournament for a fame and fortune, although she could use the fame part to gather much more followers, and biding for a more favorable opportunity to rebuild the Order. Dark mist form to avoid physical damage and for a fast travel method, can engulf a certain area with dark magic, mind control (There are still strings of dark magic attached to the converted, if Tourach somehow leaves the plane, or if someone breaks those magical strings, then the control can be broken. Dying doesn't turn the controlled back to normal unless her soul is somehow erased entirely. ), soul control, necromancy (Raising a certain number of dead bodies by imbuing them with black mana. ), empowerment through dark rituals from her mind controlled followers that can give her extra boost of black mana, more rituals means more powers, mana-imbued touch that can wither away living beings, memory extraction and erasure. Doesn't need common food or air to breathe to sustain herself, instead she needs the black mana or the life of another living beings to sustain herself. - Can't forcefully control non-living beings such as mechanical constructs or beings that higher than her. - Still somehow just like another normal undead in her corporeal form. ( Just like @sanjaya666 did a moment ago, it would be helpful if you would tell me about your character's traits, abilities, strengths and weaknesses. Either send me a message or post them here. @TenebrisNemo I dont think I will be able to join this one, I have had very little spare time. PM when the next one starts. I wouldn't mind a 32 champion tournament. It will make it all the more likely that I won't have to fight my friends. Gyar is a natural digger, capable of subterranean travel at high speeds, and leaving tunnels about his size behind him. Gyar is naturally equipped to hunt smaller animals, including sharp teeth and a tendency to pursue his "prey." -Doesn't think beyond the immediate present. As a hatchling, Gyar hasn't learned to think beyond his immediate perception. Most of Caphria's physical strength and skills come from the faith others have in her; when she is leading an army who trusts her, she can kill a dragon with a single swing if necessary. Other than her above average agility and ability to perform outstanding feats due to others' belief, Caphria is extremely limited in her physical capabilities. She is extremely fragile, and despite being able to wield her rapiers effectively, cannot deal a mortal wound without a perfect hit. The physical abilities that Caphria receives from others are a double-edged sword, as the lack of such faith can easily cripple her to beyond being suitable for battle. As an example, when being cast down by the angels after a tremendous defeat, she could barely walk, let alone carry her swords without crumpling.